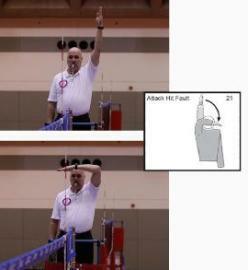 Volleyball referee signals for officiating volleyball. This signal is for when the ball isn't released from the hand at the moment of service contact or if the server doesn't execute the service properly. The motion starts at the thigh and there is less bend at the elbow. Extend the arm with the palm up. Start at the thigh and end at the waist. Avoid making the signal look like the catch signal. When the server doesn't contact the ball within 8 seconds, raise both arms above your head. Use five digits on the right hand, and thumb and the first fingers on the left hand. Always use the same digits on each hand no matter which side the fault occurred. For 14 and under, use one-handed signal for a five second delay. Situations where you would call a net fault. The served ball doesn't cross the net. A player touches the net and interferes with play, including deflection of the opponents ball in the body of the net. You signal by touching the top of the net, palm facing the net with the hand on the side of the team that committed the fault. As a second referee, you don't repeat the signal for a ball that doesn't cross the net on the serve. For a net fault as a second referee, you aren't required to touch the net, net cable, or post. An air net is preferred. This will save time and extra effort required to move forward. Second referee is required to step to the side of the net of the team that committed the net fault. This is true of any fault. 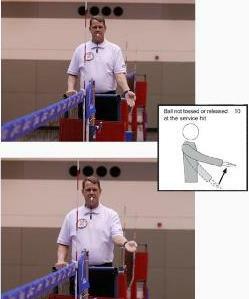 Remember, the first referee doesn't make air net hand signals. For a net fault, indicate the player with an open hand and not the finger. You only indicate the player when you whistle the fault, not when the second referee whistles the net fault. Volleyball Referee Signals for "Replay"
Anytime a rally must be replayed, signal a replay by holding two fists above the shoulders with thumbs up. A rally may be replayed if an object or ball comes on the court during play and causes a safety concern or causes interference or when both teams commit a fault at the same instance. The same signal is used for illegal blocking and screening. Extend both arms vertically with the palms facing forward. When showing this signal, it may be necessary to show the player or players at fault. The signal for a position fault or rotation fault is held at waist height. Make a clockwise circular motion with the index finger pointed towards the floor. Make the circular motion no more than twice. After the signal, indicate the players at fault. You need to indicate what players in order to prevent a subsequent occurrence on the next whistle of service. When a player reaches illegally beyond the net contacting the ball or the opponent, show the reaching beyond the net signal. Place the forearm across the net without touching the net or net cable. The palm should be down and perpendicular to the net. After showing the signal, indicate the player at fault. When a player attacks the ball illegally, extend the arm straight up above the shoulder with hand open. Bend at the elbow and make a downward motion toward the opposing team. The downward motion ends at just above eye level as to not block your vision of the court. After the signal, indicate the player at fault. If a team contacts the ball more than 3 times without sending it back over the net, and the 3 and 4 contacts aren't made by the same player, then signal 4 hits. Signal by extending the arm with 4 fingers. This should be slightly to the side and above the head. Remember, if the same player makes the 3rd and 4th contact, the signal is 2 hits.